YOU couldn’t make it up. Ballyboden St Enda’s and Coolderry played out the most incredible – make that surreal – contest at Parnell Park today. The champions of Dublin and Offaly shared ten goals and 53 points and it required two bouts of extra-time (officially lasting half-an-hour, in reality far longer) before a winner eventually emerged. 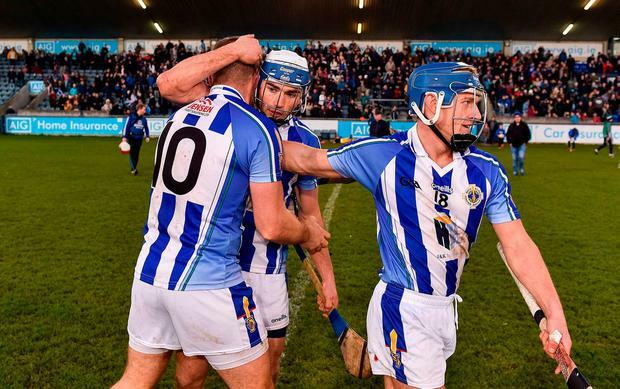 And that proved to be Ballyboden, who now meet Ballyhale Shamrocks in a fortnight – presuming they can summon up the energy to do so after this classic. The Firhouse Road men finally landed the knockout blow in the last five minutes of the final period of extra-time via a hat-trick of Paul Ryan frees. The Dublin senior ace finished with 0-14 but the real star of the show for Boden was county footballer Collie Basquel. Starting his first ever senior championship hurling game for his club, Basquel scored 3-3 from play, make an inspired block to set up a goal for Conal Keaney, and generally tormented the Coolderry full-back line with his blinding pace and directness. And yet he wasn’t top scorer by a long shot – that honour belonged to Coolderry veteran Brian Carroll who kept his team alive more than once while amassing 2-16. And yet Brady didn’t see out the contest, the first of four players sent off in the second spell of extra-time. Brady received a straight red card after a melee that resulted in a yellow card for Keaney. Soon after, Kevin Brady was the second Coolderry player to walk on a straight red and Keaney also received his marching orders … but the referee’s original penalty decision stood and Stephen Corcoran advanced from his own goal to level the tie once more. And so we prepared for one last five minutes but, as 13 men tired against 14, Boden kicked for one. There was one final flashpoint as ‘keeper Corcoran became the third Coolderry player to walk on a straight red. For the second consecutive round of this AIB Leinster club senior hurling championship, the Dublin kingpins were pushed to extra-time. And after 20 minutes of extra-time they still couldn’t be separated from a wonderfully defiant Coolderry team that refused to give up. And so the adventure carried over to a further ten minutes. Who would be the first to crack? Before the action even resumed, we had rival chants of ‘Boden!’ and ‘Coolderry!’ from the main stand, as an estimated 4,000 spectators revelled in a surprising mid-November classic. Much, much earlier we had a dream-like start from Boden. After just 70 seconds, Niall Ryan shredded the Coolderry defence with a blisteringly fast run that ended with a Roy of the Rovers finish to the top right corner. The Coolderry backs were still reaching for the smelling salts when another incisive run, this time from Aidan Mellett, created the opening for Collie Basquel (he of Dublin football fame) to fire home a second goal. The clock read two minutes and 15 seconds; another 45 seconds later, Basquel had added a point to make it a seven-point game. What followed, while incremental, was almost as remarkable: dragged out of their shell-shock by veteran Brian Carroll, Coolderry hit six rapid-fire points on the spin to trail by just one after eight minutes. But, despite edging to within a point on four separate occasions, they never drew level before the midpoint. And then the Offaly champions suffered what appeared a decisive hammer-blow in the 25th minute. This one was utterly avoidable, as ‘keeper Stephen Corcoran fatally delayed his clearance and was consequently half-blocked by the livewire Basquel. The sliotar travelled less than 20 metres – straight to Conal Keaney, whose angled shot arrowed with inch-perfect precision just inside the left upright of an unguarded Coolderry goal. At half-time the hosts led by 3-8 to 0-10 despite the best efforts of Carroll who already had 0-8 (5f) to his name. SCORERS - Ballyboden: P Ryan 0-14 (11f, 1 ‘65’), C Basquel 3-3, C Keaney 1-1, N Ryan 1-0, P Doherty 0-3, S Durkin, S O’Connor, D Curtin 0-2 each, A Mellett 0-1. Coolderry: B Carroll 2-16 (11f), D Parlon 1-1, C Molloy 1-0, S Corcoran (pen) 1-0, K Connolly 0-3, D Miller, C Parlon, M Bergin, W Malone, M Corcoran 0-1 each. BALLYBODEN: C O’Donoghue; J Madden, L Corcoran, D O’Connor; S Durkin, S Lambert, D Curran; S O’Connor, D Curtin; A Mellett, N McMorrow, N Ryan; C Keaney, C Basquel, P Ryan. Subs: C Dooley for Ryan (41), P Doherty for Curtin (47), F McGarry for S O’Connor (53), M Travers for Mellett (59), Mellett for Travers (et), C McCormack for Travers (73). COOLDERRY: S Corcoran; S Connolly, T Corcoran, S Burke; B Teehan, K Brady, B Kelly; M Bergin, D King; C Molloy, B Carroll, E Parlon; K Connolly, M Corcoran, D Miller. Subs: C Parlon for M Corcoran (ht), D Parlon for Miller (45), J Brady for Bergin (47), W Malone for T Corcoran (49), Bergin for Kelly (70), M Corcoran for E Parlon (70), Miller for Molloy (76).